Apple's legendary efforts to keep upcoming products a secret are widely known, but the terms of the agreements that bind suppliers and workers were revealed in part on Friday, thanks to newly unsealed court filings. The terms of Apple's extensive non-disclosure agreements were disclosed thanks to the ongoing bankruptcy court proceedings of former sapphire supplier GT Advanced Technologies. On Friday, a New Hampshire judge made public a number of documents from the case, and among them was the confidentiality agreement that Apple and GTAT agreed to, and was previously kept a secret. 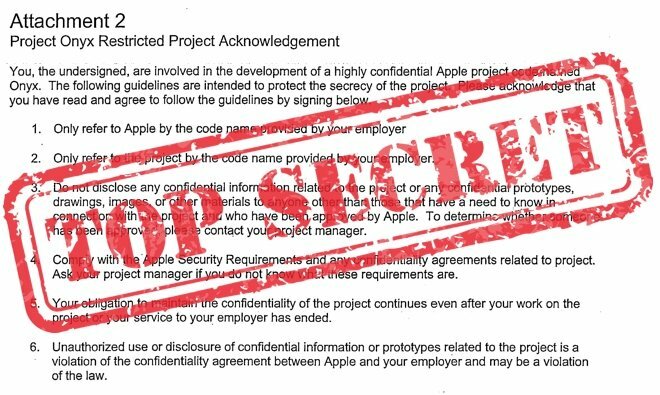 Projects with Apple and its suppliers are given secret code names to prevent leaks. The sapphire manufacturing operation run by GT Advanced was known as "Project Onyx." The supplier contracts require that suppliers not even mention Apple by name during the course of their daily operations. Instead, employees are given a code-name by which they are told to refer to Apple in conversation. The project itself is also given a secret code-name, as required by Apple. In the case of GT Advanced's partnership with Apple, their sapphire production operations were referred to as "Project Onyx." Apple suppliers are also required to lock down their operations with a qualified security team, 24/7 security cameras, sensors, a personnel identification credential screening, and vehicle markings. These physical security measures are required at both facilities and production lines. Suppliers are also required to track all confidential materials closely, and to have methods in place to destroy scrap materials so that they do not escape into the hands of the public. 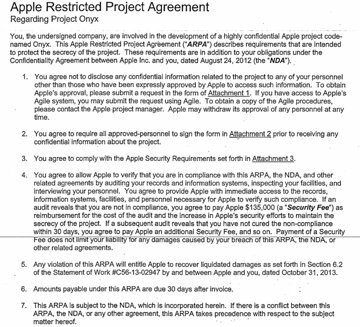 The terms of Apple's non-disclosure agreements (click to enlarge). 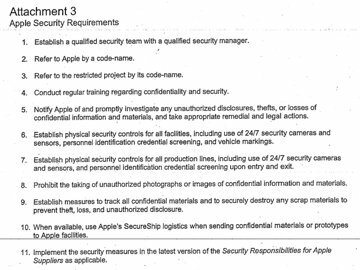 In the event that secrets must be transported, Apple has its own "SecureShip" service used to mail confidential materials or prototypes back to Apple's own facilities. To ensure that all of these guidelines are met, suppliers must also agree to be audited by Apple at any time. These extensive audits grant Apple access to the supplier's information systems, facilities, and personnel that work for the company. If Apple's investigation reveals that the supplier is not in compliance, the company must pay a $135,000 "security fee" as a reimbursement for the cost of the audit and any changes needed to bring security up to requirements. 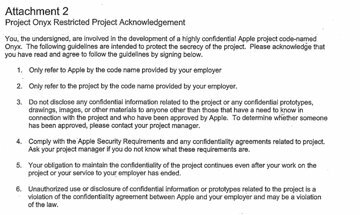 The contract is known internally as the "Apple Restricted Project Agreement." GTAT's bankruptcy proceedings previously revealed that Apple's supplier contracts include a $50 million penalty for leaking future product info. The hefty penalty is said to be imposed for each individual leak, providing a rather costly incentive for suppliers to crack down on security.